Washington D.C. was both the capitol of the United States, but also the black elite. It was in this city, which was built with the labor of thousands of African-Americans, to which the beacon lights of the nation drew like moths to a flame. The “colored elite” of the capitol centered around Howard University and the governmental posts, and elites from other cities knew their status was assured if they were accepted by Washington’s black society (much in the manner of white elites gaining recognition if they conquered Newport and New York Society). However, the black elite in other cities had their own unique stories to tell, which were tied inexplicably to the unique status of both enslaved blacks and free persons of color before the Civil War. Baltimore: the city’s proximity to Washington meant the elites of both cities mingled frequently, and society comprised natives of Baltimore and relations of Washington elites. Possessing one of the largest populations of African-Americans before and after the Civil War, by the late nineteenth century, Baltimore’s elite society emerged from the free families aligned with the city’s civic, educational, and religious life for generations. Tying the black elite together was the presence of George Murray, who was born free in 1773 and lived until 1890. Those living in Baltimore were rather affluent as well, with a black editor calculating the collective wealth of the elites at approximately $500,000, of which $75,000 was the worth of John Locke, the owner of a hack and funeral business. Others gained their wealth from catering, barbering, hod-carrying, brickmaking, and caulking. The wealth and relative leisure permitted vacations, and the most popular spots were Harper’s Ferry, Cape May, and Arundel-on-the-Bay, later called Highland Beach, which was founded by Frederick Douglass’ son Charles. Charleston: this was the most aristocratic city of the South for blacks and whites, and most if not all, of the black elites in this city had deep (miscegenation) ties to the white aristocrats. During the antebellum era, they existed in a happy plane below whites but above slaves, and indeed, a number owned slaves themselves. They were the most exclusive of black elite circles, and most considered Charleston society superior to any other city. New Orleans: As with Charleston, a substantial portion of the black elite traced their lineage to free people of color, but they developed on a completely separate line than Charleston due to New Orleans’ unique history. They “enjoyed more privileges and were more respected by their white neighbors than in any other city in the United States” and were considered, at best, quasi citizens. This situation created a “peculiar social system” wherein “men who elsewhere would be called ‘colored’ because of their known African origins, f[ound] their social business here as Creoles.” Though Jim Crow put a crimp in their antebellum status, they nonetheless prided themselves on their education, their breeding, and wealth. Philadelphia: The old families of this city contained three distinct components: native Philadelphians, the West-Indian group, and fair-complexion, free-born Southerners who migrated there in the eighteenth and nineteenth centuries. Much of the wealth came from catering, and the most renowned and successful cater was Robert Bogle, whose patrons were esteemed white Philadelphians. Black elites here were closely identified with the abolitionist movement, several benevolent societies, various civic and religious enterprises, and especially the prestigious Banneker Institute. Unlike the cities of the South (as you will see with other Northern cities), the old elite quickly adapted to the influx of educated and skilled blacks who migrated north after Reconstruction, retaining their social prominence by entering the fields of law, medicine, education and business. New York: the black population in the city was small but elegant. They, like the old Philadelphia aristocracy, were made up of native New Yorkers (many of whom traced their lineage to the days of Dutch settlement), migrants to the city, and West Indian emigres. This elite group was divided in two, with the New York and Brooklyn factions battling for exclusiveness. Brooklyn won out, however, especially after the harsh racial climate after the Draft Riots and the influx of black Southerners after the Civil War. In 1895, the New York Times was moved to note that as soon as black New Yorkers “amass a comfortable fortune, they move across the East River [to Brooklyn]”. Most were of the professional class; caterers, physicians, druggists, and so on, with much of their wealth derived from real estate holdings. On the subject of Harlem, blacks did not begin to move to this area until the late 1900s, and most of the wealthy residents were not of the black elite. Boston: elite black Bostonians were even more tied to abolitionist circles than in Philadelphia. Though they made up only 2% of the black population of the city, they counted attorneys, physicians, salaried employees, business proprietors, and literary and musical people a part of their small, exclusive circle. Their vocations brought them in contact with upper-class whites more often than lower-class blacks, with many taking part in the city’s civic life (for example, George L. Ruffin, a Harvard-educated lawyer, served as a legislator and city judge). Their circle was difficult to pierce, and Boston’s black elite tended to associate with their white neighbors, they employed white servants, attended a few select churches, and vacationed together at Saratoga and Oak Bluff (Martha’s Vineyard). Unlike any other city, black Brahmins were privileged enough to attend public events such as performances at the Boston Symphony, the opera, celebrations at Harvard, and races at Mystic Park, where a few of their horses won cups. Chicago: the city was first settled by a black sable trader from Santo Domingo, but the black population didn’t become identifiable until the 1840s, and was made up of escaped slaves and free blacks from the North and the South. Though Chicago had a reputation as a “sinkhole of abolition,” this was not the case for black Chicagoans, who lived beneath a yoke of legal and extralegal discrimination. After the Civil War, blacks in Chicago battled discrimination in housing, employment, and the use of public conveyances, but a black elite nevertheless thrived. 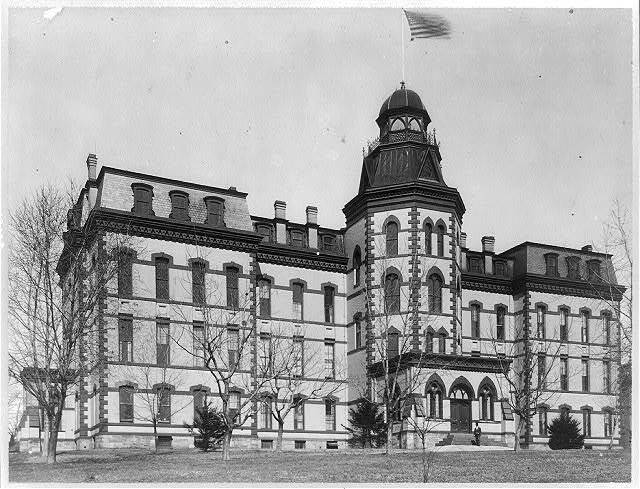 A unique feature of black Chicago was its professional tone: society was led by physicians, dentists, druggists, and attorneys. Fannie Barrier Williams was certain that the black aristocracy in Chicago was “better dressed, better housed, and better mannered than almost anywhere in the wide west.” Though education was paramount, wealthy black businessmen were able to join society by the 1920s. The West: black communities on the West coast remained small until WWI, where in 1900, the combined population of blacks in San Francisco, Seattle, Denver, and Los Angeles numbered but 7,191–less than 1/8th of Philadelphia and less than 1/4th of Chicago. San Francisco was the hub of black elites in the West, and the keyword for telling who was who was the use of the word “pioneer.” Los Angeles’ black population surpassed that of San Francisco’s after 1900, and was marked by the city’s founding by blacks and mulattoes, as well as the vast numbers of professional blacks who migrate to Los Angeles after 1890. Seattle’s black population was very small–406 in 1900–but the wealthy residents were considerably well-to-do, the most comfortable being the Caytons, publishers and editors of the Seattle Republican, who lived in spacious house on Capital Hill, the city’s most exclusive neighborhood, and existed between the black and white worlds. Denver’s population grew from 23 in 1866 to 4000 in 1900, more than one wealthy black family gained prominence after the gold rush. The “Exhibit of American Negroes” included thousands of photographs, as well as hundreds of books, pamphlets and assorted documents chronicling the experience of African Americans up to the year 1900. 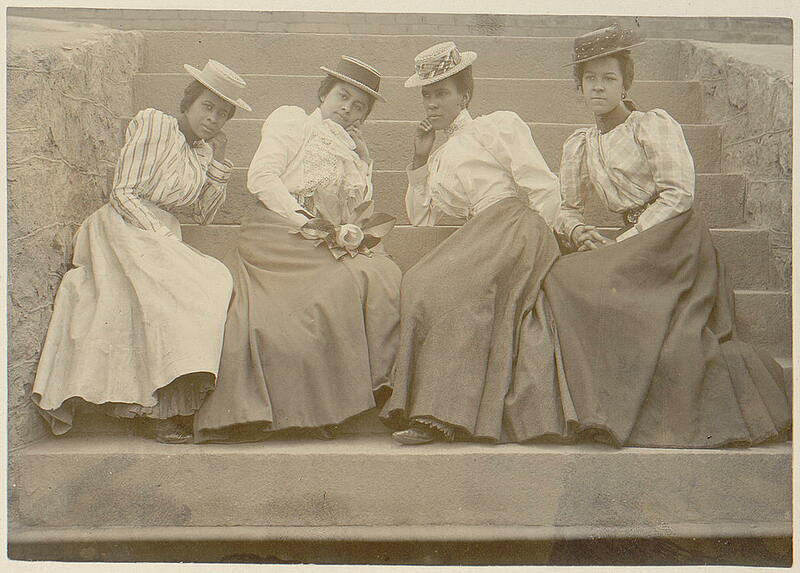 This is a sample of the photographs assembled for the exhibit, with a focus on the women. Unfortunately, these photos did not include the names of the subjects, and we are left with generic descriptions of these beautiful and no doubt interesting women from the turn of the century. During the Gilded Age, American publishers met the needs of social climbers aspiring to emulate their betters by producing endless etiquette manuals, so did small presses meet the aspirations of newly wealthy blacks surging into the enclaves formerly preserved for the black elite. These etiquette books addressed the unique situation in which black Americans were placed, for while the authors stressed the importance of good manners and breeding, they also emphasized the need to repudiate the common perceptions of blacks and their “natural” behavior. Hackley, a classical singer who studied voice in Europe, “championed the use of African-American spirituals among her own people as a tool for social change.” According to the manual, The Colored Girl Beautiful was compiled from talks given to girls in colored boarding schools across the United States. 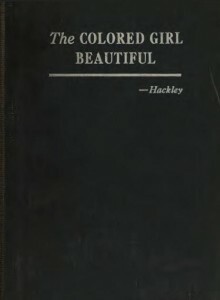 Though Hackley addresses the spiritual side of black women and their role in the uplift of the race, it is most telling that much of her advice focuses on refuting the notion of black women as harlots and jezebels (an image forced on them to excuse the indignities they faced from white men), and how to navigate being an educated, upwardly mobile young woman in a time where her intelligence and breeding was not appreciated. To modern eyes, the manual can seem overly conscious of presenting a positive image before whites, but otherwise, regarding gender roles, it is no different than what can be found in etiquette manuals aimed at the general populace. 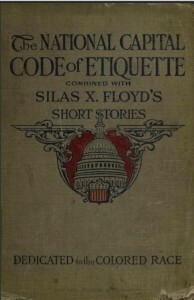 Less is known of Green, but his etiquette manual includes short stories contrasting mannered and unruly behavior written by Silas X. Floyd, a graduate of Atlanta University and Baptist pastor. Prior to the Great Migration which drew blacks from the South to northern cities like Chicago or Detroit or New York City, Washington D.C. had long been a mecca for blacks. This book was written at the height of Jim Crow, when blacks of the elite and of the lower classes, were barred from public places of amusement.